The Pearl™ Monoclonal IgG Purification Kit allows for the rapid purification of antibodies from cell culture supernatant and ascites fluid. 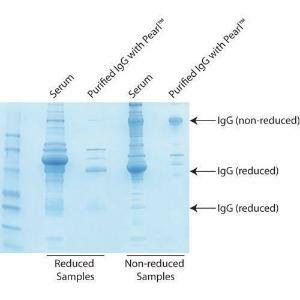 The Pearl™ IgG purification resin binds the high abundant, non-IgG proteins (i.e. albumin) and allows the IgG molecules to pass through in a physiological buffer. The IgG molecules can be stored or used in downstream applications without further clean-up, such as ammonium sulphate precipitation. The Pearl™ Monoclonal IgG Purification Kit can be used to purify antibodies direct from cell culture supernatant with less than 10% FBS or can be used with ascites fluid after treatment with the supplied Ascites PreTreat. The kit can purify IgG from ~1L cell culture supernatant or 200 ml ascites fluid.